Super fast tubular for pure speed events, profiled for the latest wide-aero rims. The Corsa Speed (Tubeless ready) has been measured at 40% less rolling resistance compared to the same product without pristine Graphene. 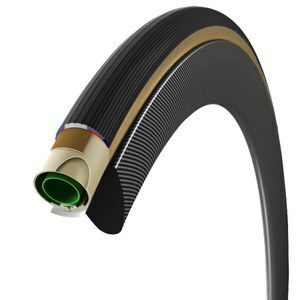 Vittoria has done elaborate independent testing that clearly proves it is the fastest tyre in the world. Lab tests have shown a 32 second speed advantage over the nearest competitor after 50 kilometers. G+Isotech® is Vittoria’s unique Graphene compound with revolutionary G+, as provided by technology partner Directa Plus. No compromise is necessary with this compound that is superior in speed (rolling resistance), grip, durability and wear resistance. Have had two of these tires. More durable than expected and yes they feel fast and ride quite well. They are my main go-to tires for fast club rides on my best 44f/55r tubular rims. The only choice for me ! Ultra thin the fastest tires I ever rode. After receiving them I thought that the only place I could use them is my living room. I used Caffelatex immediately and I hope for the best. I did not see any recommendation if to use glue or tape to mount them - I used tape and I'm worrying a lot as the tires latex bottom doesnt glue to it perfectly - I just hope that the high pressure will help.As an experience I'm happy with my purchase , in the future I will stick with my fave Conti Competition. My order came as expected and i am happy with the tires and i have recommended ProBikeKit to a friend!